It's been a while since I last looked at JSF seriously. The projects I work on day-to-day for the last little while have been Swing and Struts-based. However, I recently had good reason to delve back in where I left off quite a while ago, and frankly, not much seems to have changed. Probably the most significant progress is in visual JSF development and AJAX support. We're seeing more developed components and better integration. However, out of the box support for getting up and running with different JSF configurations is still sparse. I feel that things could be a lot smoother with smarter tools support. JSF is still struggling for dominance over a legacy created by Struts adoption, and an uphill battle against burnt fingers and mis-information about the framework. I agree with Rick Hightower, that, once configured, you can be more productive and will find things more intuitive than Struts. However, if the goal is to make things as smooth as, say, ASP.NET 2.0, there is still some way to go. 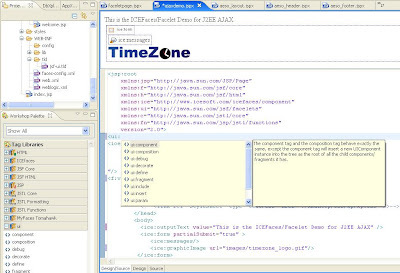 Having worked with Weblogic 10 for the last little while, I have been impressed with the complete toolset, including the development environment which allows easy integration with Weblogic server on the desktop. Weblogic Workshop is a custom version of Eclipse which includes advanced support for JSF authoring. 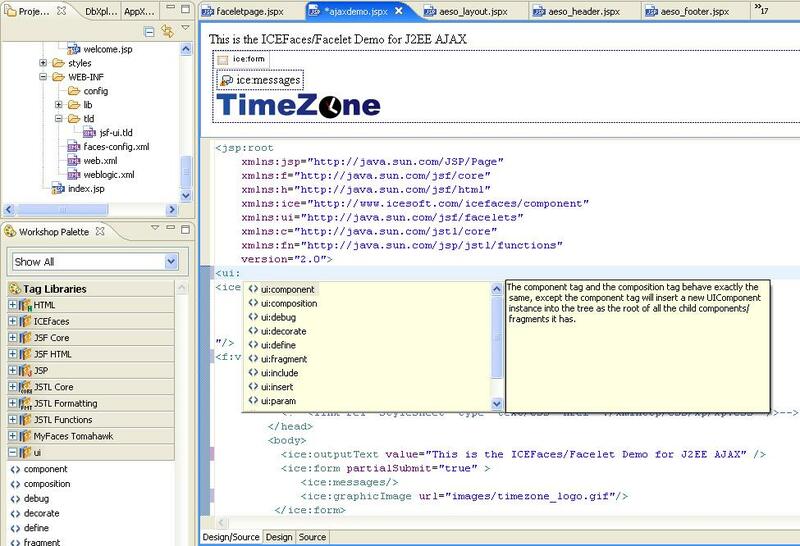 BEA now includes ICEFaces support within the IDE. However, I ran across a couple of gotcha's which you may be interested in knowing. Read BEA Dev2Dev introductory article here. BEA support at present is for ICE Faces 1.5.3. It can be added as a Facet to a Dynamic Web Project. The next logical step for BEA would be to include facelets as a project facet dependent on the ICEFaces facet. Another thing that wasn't immediately apparent to me, is that icefaces-facelets.jar is a complete implementation of facelets, so you don't need to include jsf-facelets.jar in your project. Use icefaces-facelets.jar instead of the default implementation. Once you get Facelets and ICE Faces configured correctly, you will probably want the IDE to help you with the TAG syntax. However, you will find that you will have little code-completion context help if you use the XHTML format preferred by Facelets. Eclipse in general is not much help here. MyEclipse has made an effort to correct this oversight. However, all is not lost if you're using Eclipse WTP or Weblogic Workshop. The trick is to use JSPX format to declare your namespaces. This will introduce code completion for your ICEFaces components, but Facelets tags will still be ignored. You need to get hold of the TLD taglib file for Facelets and place it into WEB-INF/tld. I guess I've been camping too much this Summer to blog! I presented at CJUG this month on F8 - The Facebook Developer Platform for Java. I'm being lazy, and so I'll redirect you to the Facebook Event where I posted links for those of you dying to get your apps developed and registered on Facebook.